In the world of Kubrick’s Game, auteur filmmaker Stanley Kubrick has left a puzzle woven throughout his films to be deciphered as part of a game with an uncertain prize. Shawn Hagan, a first-year UCLA film student, is brought into this game at the suggestion of his would-be mentor, Professor Mascaro. He brings along his film school buddies Wilson (a former child television star) and Sami (the only other filmmaker Shawn respects at UCLA) to begin the game. They solve riddle after riddle left by the master filmmaker, and along the way they discover not only competition but forces that would prefer Kubrick’s puzzle to remain unsolved. I leapt at the opportunity to review this novel because it seemed to be aimed right at me. I was a film student once. I am a fan of Kubrick. I have been known to indulge a conspiracy theory from time to time. I have a deep fondness for pretty much anything that is “mind-bending.” So I thought I would be the perfect reader. As it turns out, I was the probably the last person that should’ve reviewed Kubrick’s Game. These are possibly minor errors for most, but it also points to a larger problem with the book as a whole: this is a book about a great filmmaker that isn’t terribly cinematic—it lacks anything close to the unearthly visuals that made Kubrick who he was. While I may disagree with the author’s reading of Kubrick’s filmography, I can ignore that as a difference of opinion. What I can’t ignore are the many missed visual opportunities that occur with nearly every turn of the plot. The author uses fairly low-resolution black-and-white stills to illustrate the key moments from Kubrick’s films on which the puzzle hinges. These frames do little justice to the original cinematography, and by rendering the color frames in black and white, the author is committing the very sin of not respecting Kubrick’s vision that much of the book revolves around. Beyond this, there was an opportunity to really do some nice prose work and show what was compelling about these images. The book could have offered a potent and poetic translation of Kubrick’s cinema, but instead it settles for a term-paper presentation style. Happily for another reader, perhaps, it isn’t all bad news. The writing is solid, and the characters are rendered well for the story. Kent has made a name for himself writing young-adult fiction, and this shines through Kubrick’s Game on every level. The point of view is fixed in the head of a college freshman, without a doubt. Shawn sees himself as the “weird” kid, the result of growing up with some variety of autism that renders many social interactions alien to him. This was a solid character touch and perfect for the world of this book as well as for Kubrick’s often alienated narratives. It is by far one of the strongest parts of the book. The plot touches on many of the popular theories surrounding Kubrick’s career, some of them handled off-handedly, but the numerous explanations of the notorious Apollo 11 myth are the best parts of the intrigue. There’s a theory offered that I hadn’t read before, which was a pleasant nugget that arrived just as I was about to give up on caring about the story. There are also cameos by folks such as Malcolm McDowell and Steven Spielberg, but they are rendered in a generic way that makes them feel less authentic then a Scooby-Doo walk-on. Perhaps the ideal readers for this novel are people who are passively interested in the world of filmmaking, filmmakers, and Stanley Kubrick. The press blurbs for the book compare it to The Da Vinci Code, and that is certainly fair. 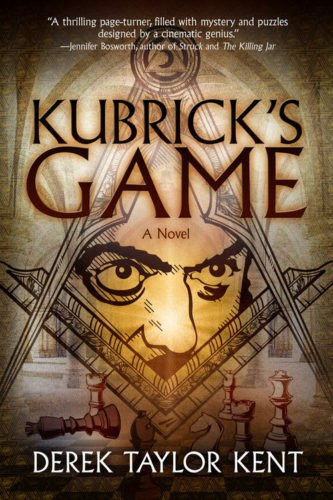 There is a thin old-world conspiracy in this novel, as there is in the Dan Brown bestseller, but the real similarity is the way in which Kubrick’s Game flirts with material that could be presented in much more depth and accuracy but is not. The most painful irony, of course, is that Stanley Kubrick himself was a stickler for detail and resonance (if not always accuracy), and so that makes the lack in this story all the more clear. Basically, it’s about the same as asking us to believe that Kubrick wouldn’t notice, or care, about the double shadows all across his “fake” moon footage. You can imagine all sorts of explanations, but none of them really hold together or feel true. This is the difference between wonder and confusion, something Kubrick understood very well.